A collection of xrays of fracture of humerus in adult skeleton are being presented and would be updated regularly. Following image depicts an xray of 5 years old woman who suffered fracture of humerus after a trivial fall. This is a postoperative x-ray of the arm of 43 years old female who suffered a fall on her hand which resulted in fractures of the humerus. The side involved was left. At first, she was given a trial of conservative treatment in form of a hanging cast but serial follow up x-rays failed to show any contact. After 3 weeks of her injury, she was treated with open reduction and internal fixation using low contact dynamic compression plate (LCDCP) and autogenous bone grafting which was harvested from her left iliac crest. The patient is still in follow up and is showing good bone healing. Conservative treatment in obese persons is relatively difficult. In my experience, nothing suits an obese arm as for as splintage is considered. The splint does not provide any support because it cannot snugly fit due to fat and the fracture mobility is unchecked. I have always found it difficult to treat obese patients by conservative means. I am more inclined to treat them with a surgical procedure as I have found them to respond better. Intercondylar fracture of humerus occurs when a person falls on flexed hand and the elbow is axially loaded. This is an x-ray of 43 years old lady who presented to the hospital after a fall. Intercondylar fractures are mostly treated with operative methods. This patient too was operated upon and fractures were fixed using two reconstruction plates. Patient is on postoperative rehabilitation exercises. 40 years old lady who had been operated for fracture of shaft of the humerus at her native place presented in the OPD with a complaint of discharge from the fracture site and pain. The patient had an angulation of the arm and on examination, it showed abnormal mobility. One of the screws were visible through the wound and had backed out for most of its length. Xray revealed a failed plate with backed out screws. The patient was planned for implant removal, wound debridement and external fixation to control the infection and then followed by definitive surgery. The following x-ray is of 67 years old man who fell in the bathroom. He presented in the outpatient department three days after the injury with a complaint of pain and swelling in the upper part of the arm. There was substantial bruising on the arm and swelling was noted. The x-ray revealed a comminuted fracture of upper end of the humerus. The patient was advised closed reduction and internal fixation using an interlocking nail but the patient refused for surgery. Intercondylar fracture of the humerus is an intra-articular injury that almost always requires operative intervention. The x-rays are of 37 years old male who sustained an injury in a fall following a motor vehicle accident. The upper one is AP (anteroposterior) view and the lower one is lateral view. This patient was managed by open reduction and internal fixation using reconstruction plates. A 45 year old man got injured in road traffic accident. He presented with pain and swelling in the right shoulder. The x-ray he carried revealed a comminuted fracture along with subluxation of the glenohumeral joint. Xray of humerus in15-year-old girl that was fractured about 2 yrs back. The xray showed an atrophic non union of distal third of humerus. The fracture was treated with open reduction and internal fixation using a dynamic compression plate, and bone grafting. Fractures of the upper end or proximal humerus are common in all ages and the fracture pattren varies with age. While young adults suffer this injury with high velocity trauma, the fracture can occur with trivial trauma in old age. This is due to osteoporosis in old age. While the fracture upper end humerus requires surgical intervention in young adults more commonly, in older patients the fracture may be treated conservatively. The xray in the picture belongs to a 75 years old lady who suffered this injury following fall on hand in her bathroom. The patient was put on broad arm sling and treated conservatively. Till last follow up the fracture had started showing signs of union. PHILOS stands for Proximal Humerus internal locking system and 29 years old young male was treated for the upper end of the humerus and a retrauma resulted in fracture of shaft of the humerus. Following is the xray picture after the second trauma. There is a subluxation of the same shoulder joint too. The patient with following xray came for an opinion and the xray below is after one year of injury. The patient sustained an open injury which resulted in a big lacerated wound over the arm and fracture of the proximal humerus. Unable to give prior history properly, the patient indicated this fixator surgery to be second , done about 4 months before the visit to me. The patient was advised removal of external fixator and application of the brace followed by a definitive fixation and bone grafting at a later stage. Xray of fracture of proximal humerus in 38 years old lady. The patient was treated with U slab splint. Fracture of shaft of the humerus in distal part of the humerus in an adult skeleton. Fracture humerus xray in 38 year old female who got this injury in a motor vehicle accident. The fracture is comminuted. THe xray shows the third butterfly fragment quite well. Xray of 54 years old lady with an injury to elbow following a fall, The xray shows an intercondylar fracture of the distal humerus. Xray of 37 years old male with operated fracture humerus with DCP. The xray was taken after a year of surgery. The xray shows pulled out screws resulting in implant failure. The fracture has not united. This is .an xray of a highly comminuted segmental fracture of the humerus which, by the look of it seems to be a high energy injury. There is no info available with the file. So just sharing the image. Shadow of plaster slab is also visible in this xray. 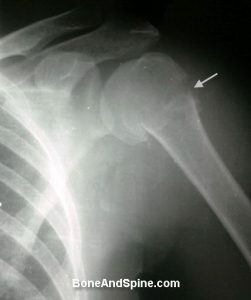 Following xray is of refracture in already united, conservatively treated fracture humerus in an eighteen years old male. This time the fracture was treated by open reduction and internal fixation using a dynamic compression plate. Following xrays are of 38 years old female who had been operated for fracture shaft of humerus about 6 months back. She complained of pain in the arm for the past two months. AP and lateral view of the arm were done; they revealed following. Anteroposterior view above shows the radiolucent area around the screws [marked with an arrow on one screw] and there appears a lack of union. The lateral view revealed an area of radiolucency (black line) almost all around the plate signifying that the plate itself was also loose. The nonunion is very evident on the lateral view. The patient treated with bone grafting and interlock nailing of the humerus. The following x-ray is taken after 4 weeks of injury and plaster application for fracture of shaft humerus in a nine years old girl child who got injured in a motor vehicle accident. The bone has united well and alignment is right though fragments are not in anatomical position. But there is no angular deformity and child has substantial remodeling potential. Supracondylar fractures of the humerus are very common injuries in children. These injuries frequently result when the child falls on an outstretched hand. Supracondylar region in children is weaker in children as the part is growing. Supracondylar fracture of humerus AP & lateral views. The xrays in the picture are anteroposterior and lateral views of the elbow of seven-year-old child who sustained injury after he fell from a tree. The fracture in present image was successfully treated non operatively. Supracondylar fractures are very common childhood injuries. Most of the fractures can be treated by conservative means. 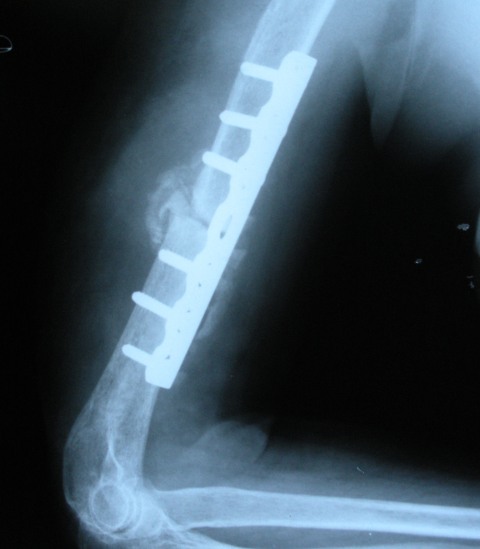 Severely displaced fractures are treated by closed reduction and percutaneous pinning. The image shows a child’s elbow in a plaster having a supracondylar fracture which is rotated and malpositioned. Supracondylar fractures are very common fractures of children. Most of these are extension type injuries where the distal fragment of the fracture goes into extension as compared to proximal part. This type of injury constitutes about 95% of the injury. Other 5% is the type where the distal fragment goes into flexion. Note that in lateral view the distal fragment has moved volar as compared to proximal fragment. These fractures are reduced and held in a position of elbow extension. The neurovascular deficit, as usual, should be carefully examined. Following x-rays are Ap and lateral view x-ray of supracondylar fracture of humerus in a child. The x-rays show good union and maintenance of the alignment. Three k-wires are also visible in x-rays. Xrays of a 9-year-old child showing a supracondylar fracture. The x-ray shows an unreduced, united fracture and new bone formation along the intact posterior periosteal sleeve. The child otherwise had a complete range of motion and cubitus varus deformity. He was advised surgical correction. The child was treated with a plaster slab. Xray of united fracture of humerus in a supracondylar region in an eight-year-old child. The x-ray was taken after 5 weeks of injury. Supracondylar fracture of humerus in 10 years old child. The fracture was treated conservatively with an above elbow posterior splint. Xray of a six-year-old child with a supracondylar fracture of the humerus which is not reduced. The patient was advised a re-reduction but the parents refused any further intervention. Xray is a lateral view of the elbow. What is nature of study you are conducting and what information do you want? Thank you for getting back to me. I am trying to establish what it is that exactly fails when a humerous implant fails. in other words – is it the humerous bone that breaks/splinters/crumbles, is it the screws that work themselves out from the bone, or is it the metal implant itself that actually breaks into 2 pieces. ? if you can advise me on this – preferably with some statistics – I will be very grateful. I am intending to look at various ways of minimizing failures (involving university graduates and post-graduates) in this study. Unfortunately there is little information available on what it is that actually breaks – and also the cause of such breakages ! If you can assist in the first, and most fundamental, question of what actually breaks – it will be very useful to me. Implant failures are not that common and that too for a particular bone. I think you would be benefited by place where upper limb referrals are sent. Your study is more of biomechanical in nature. It is better that you contact someone who is interested in biomechanics. Thank you very much for your comments and opinion. I will certainly try and contact someone who is a specialist in biomechanics. Can you suggest someone who may be able to advise me ?